This weekend marks the unofficial beginning of summer with the long Memorial Day weekend. Do you have your flag out yet? I love driving down the street seeing all of the American flags waving in the breeze. 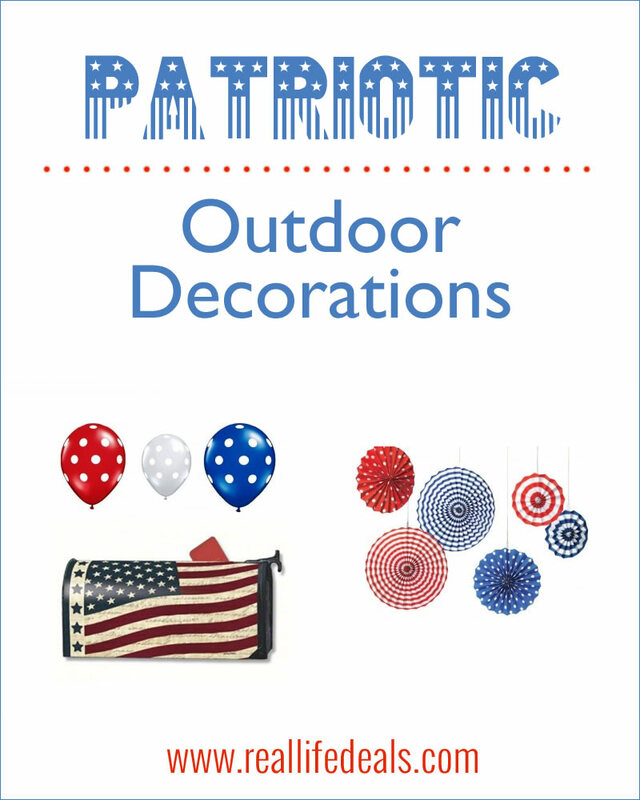 However, you can also show your patriotic pride with other outdoor decorations. Here are 8 options – you are sure to find one or two that are within your budget! Includes a 3 foot by 5 foot nylon US flag. Magnetic cover for the patriotic summer months! Let Uncle Sam greet your guests! Just fill him with plastic bags, and the sand bag inside provides stability. 6-piece Patriotic Paper Fan set includes 8″, 12″, and 16″ red, white, and blue spherical paper fans. This 22″ Red, White and Blue Burlap Wreath with Silver Starfish is the perfect front door wreath for the summer! A pair of cut-metal lawn silhouettes includes American flags, and stakes securely into the ground. Pack of 12 includes 4 Red, 4 White and 4 Blue with white polka dot balloons. Comes with 6 straight flags, 6 semi-wavy flags, and 6 wavy flags – Includes 36 EZ wires. Each flag is cut from corrugated plastic, so they are durable, long lasting, and re-usable. Which is your favorite patriotic decoration? Stacey is the owner and editor for Newlywed Survival. She is always on her computer learning new things and doesn't think she could survive without the internet! In addition to Newlywed Survival, she is a freelance web and graphic designer, a loving wife and proud owner of an adorable beagle. Stacey is passionate about the 3-Ds...design, dessert, and dogs (not necessarily in that order).